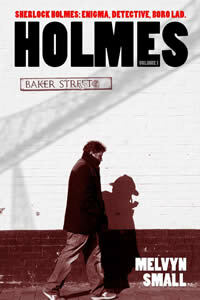 Many thanks to Michelle Ryles of The Book Magnet for the following review of Holmes Volume 1. I read and enjoyed a few Sherlock Holmes novels in my youth, so I was absolutely delighted that Melvyn Small used the same method of logic and deduction, with a huge dose of dry humour, in his Holmes Volume 1 collection of short stories. I'm not usually a big fan of short stories but this book doesn't read like a short story collection at all. With the same cast of colourful characters, each one interlinks and they are so entertaining that they flow effortlessly from one to another. Boro Sherlock Holmes is a parmo eating, ale drinking, sarcastic super-sleuth. He sees things others don't see and cleverly pieces together all the clues to solve the crime, with the help of Doctor Watson of course. There are some cracking mysteries to solve; I loved each story and, unlike most short story collections, I had no intention of stopping at the end of each one. The humour running through the book is so dry that I think I would have to read it again to pick up each and every clever little quip. Some of it is regional humour, as I'm sure not everyone would understand being as offside as Bernie Slaven (but I got that one!). Melvyn Holmes pays great homage to Sir Arthur Conan Doyle in this modern day telling of Sherlock Holmes. Boro Sherlock drinks pints of Engineer's Thumb in the Twisted lip and, being a real ale lover, I did actually google Engineer's Thumb to see if it was a real beer but found that it was a clever way to mention two of Conan Doyle's short stories: The Adventures of the Engineer's Thumb and The Man with the Twisted Lip. Holmes Volume 1 is hugely entertaining; it's a wonderful modernisation of Sherlock Holmes whilst staying true to the inimitable features of Conan Doyle's original characters. If Benedict Cumberbatch hadn't got there first, you could have easily seen cheeky chappy Boro lad Bob Mortimer in this starring role. A must-read for any Sherlock fans and those who love a good old whodunnit mystery.